Overview - Based on the novel "Cross" by James Patterson and popularized by Morgan Freeman in Kiss the Girls and Along Came a Spider, Tyler Perry takes over as Dr. Alex Cross, a homicide detective/psychologist with the Detroit Police Department. Cross meets his match in a dangerous serial killer (Fox). The two face off in a high-stakes game of cat and mouse, but when the mission gets personal, Cross is pushed to the edge of his moral and psychological limits. With a screenplay by Marc Moss and Kerry Williamson; the film is directed by Rob Cohen. Whenever a film gets universally panned upon release, it engenders a certain morbid curiosity in me. With that in mind, when I saw the unanimously reviled 'Alex Cross' was making its way to Blu-ray, I actually jumped at the chance to check it out. I mean, just look at that cover. It's like Tyler Perry is glaring specifically at me, staring me down with those wide, dead eyes, practically daring me to watch his movie. Actually, since he's also holding a rather large gun, it's more like he's threatening me. In fact, he's starting to make me feel uncomfortable. It's like he can see right into my soul! I want to look away, but I can't! It's just like Nietzsche said, "If you gaze into the abyss, the abyss also gazes into you." Oh, I was such a fool to think I could review this film and come out unscathed. I've played fast and loose with the consequences of terrible cinema, and now I'm paying the price! Please, there's still time, save yourself! Loosely based on the James Patterson novel "Cross," the story follows the exploits of Detroit detective and psychologist Alex Cross (Tyler Perry). When a ruthless assassin (Matthew Fox) is unleashed upon the city, Cross and his team are put on the case, but the violent killer doesn't take kindly to their interference, and soon their conflict is made all too personal. Determined to bring the murderous criminal to justice, the detective will have to put everything on the line, and push himself to his absolute limits -- both physically and mentally. Will he be up to the task? Maybe, but is the film itself... eh, not so much. No stranger to the silver screen, the character of Alex Cross has already made his way to cinemas before, courtesy of Morgan Freeman in the mystery/thrillers 'Kiss the Girls' and 'Along Came a Spider.' This new adaptation attempts to serve as a franchise reboot of sorts, and director Rob Cohen takes the opportunity to add generous helpings of bombastic action and showy style. While some of the movie's set pieces are entertaining enough (including a legitimately well executed car crash), more often than not the slow motion shootouts, shaky camera movements, quick cutting, and hand holding score amount to little more than empty flash -- and all this superficial spectacle seems to come at the cost of competent storytelling. At times, the writing is just plain atrocious. Painfully lazy, the script is full of paper thin plotting, one dimensional motivations, and clichéd characters. It's like a rough draft that somehow accidentally got put into production. For a movie about detectives, the film's mystery plotline is essentially nonexistent. The filmmakers try to paint Cross as some kind of Sherlock-esque master of deduction, but as written, he actually turns out to be a fairly terrible sleuth, making it difficult to see why all of his colleagues seem so impressed. As the runtime reaches its merciful end, a corporate conspiracy of sorts is eventually unraveled, focusing on a businessman who's attempting to rebuild Detroit into a clean, futuristic metropolis (you know, like EPCOT, or something), but this subplot feels tacked on and thrown in at the last minute, almost like an afterthought -- which, for a mystery film proves to be a pretty big problem. Instead, most of the runtime follows the mindless back and forth between Cross and his nameless antagonist, known only as Picasso. Why is he called Picasso? Well, because he likes to leave elaborately drawn sketches at the scenes of his crimes (seems like a good use of time). At one point, he even draws a portrait of the film's title character, and he actually manages to capture Tyler Perry's infinitely blank expression remarkably well. Hell, if he gave up on all the murdering, he could probably make a pretty comfortable living doodling caricatures of tourists on a boardwalk somewhere. Hmm, now that sounds like an interesting movie! The writers constantly cut corners throughout the narrative, creating a ridiculously unrealistic depiction of police work, and there are some humorous lapses in logic throughout. In one scene, a detective (played by Edward Burns) gets so angry that he puts a gun to the head of the man he's supposed to be protecting. The next day, the two characters meet again and laugh like old friends, completely ignoring the fact that one of them basically threatened to kill the other the night before. The standard tropes of one dimensional characterizations are all present, including a brief look into Cross' idyllic family life, giving him the thinnest and most obvious of motivations to fight for. There is absolutely no depth to any of the character development, and the runtime just skims along the surface, following a tried-and-true, totally shallow revenge narrative. Not exactly known for action roles, Tyler Perry immediately sticks out like a sore thumb. Though he appears to be giving it his all, the actor just seems out of place and woefully miscast. Despite his potentially intimidating size, Perry carries a certain dopey, almost goofy quality throughout the runtime, and some of his attempts to come across as intense border on unintentionally humorous. Unfortunately, Matthew Fox doesn't fare much better. The performer went through a dramatic physical transformation for the role, and while I admire this dedication, his efforts are sadly in vain. Bald, emaciated, but totally ripped, Fox becomes a creepy, tightly wound ball of pulsing muscle (and a far cry from the pudgy Jack seen on the last few seasons of 'Lost'). Also, he's got the "crazy eyes." Real crazy. Terrifying physical demeanor and insane facial expressions aside, the performance turns out to be disappointingly ill-conceived, and much like Perry, there are times when the character comes across as over-the-top and borderline laughable. 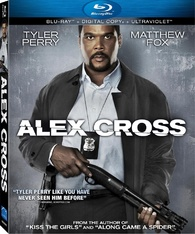 Summit presents 'Alex Cross' in a Blu-ray/Digital Copy combo pack. A BD-50 disc and instructions for a downloadable digital copy and a streaming UltraViolet version are housed in a keepcase with a cardboard slipcover. After some skippable trailers, the disc transitions to a standard menu. The movie is provided with a 1080p/AVC MPEG-4 transfer in the 2.40:1 aspect ratio. Clean, sharp, and vivid, this is a strong transfer through and through. Shot primarily on film, the source is in pristine condition with a light layer of natural grain. Fine details and textures are sharp, revealing all of the ominous intensity in the characters' frequently brooding grimaces. The cinematography adheres to a standard Hollywood action film look that offers a varied palette of colors ranging from cool to warm depending on the tone of the scene. Contrast is high and stylized without overpowering the image, leading to a pleasing sense of dimension. Black levels are deep and inky while still maintaining a decent sense of shadow delineation. Marked by a pleasing filmic sheen, 'Alex Cross' looks very good on Blu-ray. The transfer doesn't exactly standout, but the sleek and polished image is free of any technical issues and results in a nice sense of pop and depth. The film is provided with an English DTS-HD MA 7.1 track, an English Dolby Digital 2.0 track, and a Spanish Dolby Digital 5.1 track. Optional English SDH, English, and Spanish subtitles are also provided. Punchy and immersive, this is a powerful mix that is appropriately bombastic while still featuring a solid sense of auditory texture. Dialogue is clear, full, and well balanced throughout. The soundscape is enveloping and spacious, adding an effective layer of ambiance and bravado to action set pieces and quieter sequences alike. Subtler sounds like snapping cameras at a crime scene or creaking floor boards during the film's climax are dispersed directionally with natural imaging and crisp fidelity. Surrounds engage nicely during the film's numerous shootouts sending ricocheting bullet fire throughout the front and rear speakers. Gun blasts, punches, roaring engines, and zooming trains all carry a powerful jolt, and the movie's various explosions offer room thumping bass activity. High frequencies are also stable and distortion free, demonstrating a wide dynamic range. Like the video transfer, the movie's audio mix is certainly impressive, but doesn’t quite have that extra dash of nuance and aural engagement that ends up elevating the very best soundtracks. Action junkies should still be very pleased, however, as the flashy effects and lively design work are sure to give your audio setup a nice workout. Summit has put together a decent collection of special features, including a commentary and deleted scenes. All of the extras are presented in 1080p with Dolby Digital 2.0 audio and no subtitle options. Audio Commentary with Director Rob Cohen - Cohen goes solo for this track and provides a straight forward but uneventful discussion. The filmmaker traces the movie's origins, details locations, and elaborates on the atypical casting of Tyler Perry and Matthew Fox. Cohen spends a bit too much time simply summarizing the plot, but does offer a fair amount of production trivia along the way. As one might expect, however, he remains completely oblivious to any of the film's glaring flaws and shares hopes for both a director's cut and a sequel. Something tells me this commentary was probably recorded before the movie's release. Deleted Scenes (HD, 5 min) - Four deleted scenes are viewable together or separately. These excised bits are mostly negligible, but one scene offering a bit more detective work from Cross and another sequence that elaborates on the ill-conceived Pop Pop subplot should probably have stayed in the final cut. Psychologist and the Butcher: Adapting & Filming Alex Cross (HD, 5 min) - Interviews with author James Paterson as well as the film's cast and crew are interspersed with some brief behind-the-scenes footage. The participants discuss the original novels and the character of Alex Cross, elaborating on the book's path to the screen. Though mostly promotional fluff, there are a few decent insights here that fans might find interesting. Infamous for its mediocrity, 'Alex Cross' mostly lives up to its poor reputation. Despite well-meaning attempts from the cast, Perry and Fox are both led astray by lackluster direction and terrible scripting. The flick has some mindless entertainment value, but it's not enough to really warrant a look. On the plus side, the disc is home to a strong video transfer and a powerful audio mix. The supplements aren't very in depth, but the commentary, featurette, and deleted scenes are decent inclusions. While not quite as abysmal as I was expecting, even with the strong technical presentation, this is still an easily skippable release. That is, if you can resist Perry's blank, threatening expression at the top of the page, clearly daring you to watch his terrible film.